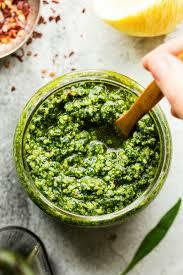 This pesto is easy to make, uses seasonal produce and tastes fantastic. Stir though pasta, serve with chicken or use as a dip - the options are endless. Place all the ingredients into a food processor and blitz until smooth. Add a little more oil if you prefer a looser consistency. Season with sea salt and ground black pepper to taste. Transfer to clean jars and top with an extra drizzle of oil to create a seal. The jars will keep in the fridge for at least one week.